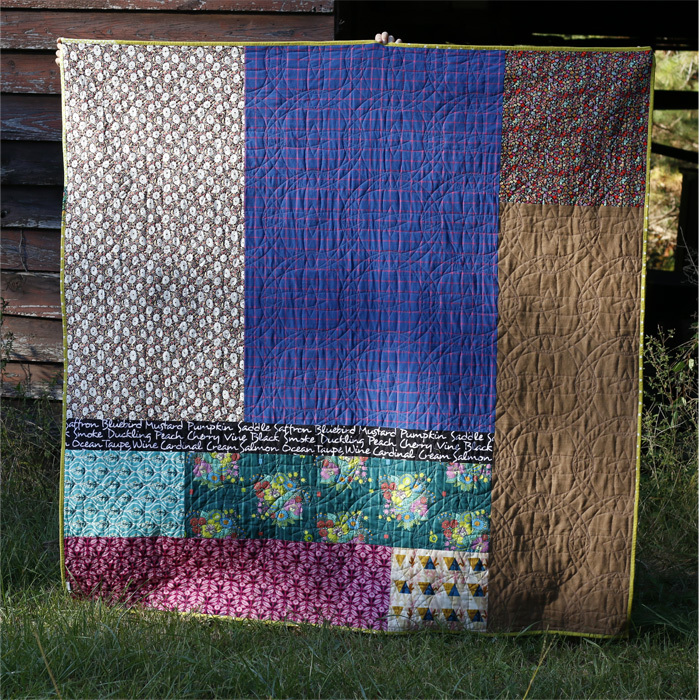 On this Thanksgiving Eve, I think Plum Pudding is just the name for this decadent patchwork quilt. Why it was a few Novembers past that I made a Cranberry Tart quilt and someday I should schedule an “Apple Pie” apple core quilt for this time too. Why not? I even love to bake in real life, wink. Thanks for the suggestion, Kim! This quilt was such a delight to sew that I’m sure to make another flowering snowball quilt again. I’m glad I have the templates! Someone asked if I’ll be making a pattern, but I don’t plan to. This is a classic block, not my special creation. You can pick up templates and then easily make your own so long as you have curves sewing skills. 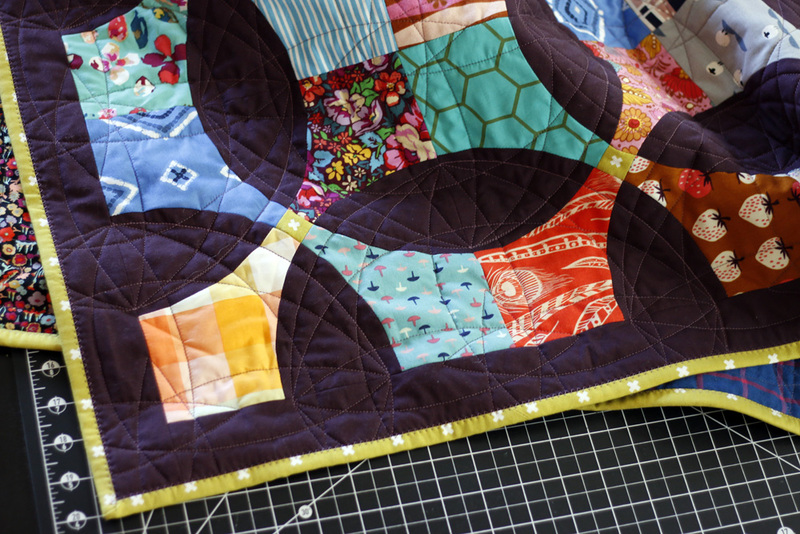 For a look like this, choose a 9” finished block and 2” border (which was every last drop of that Kona Raisin fabric!). 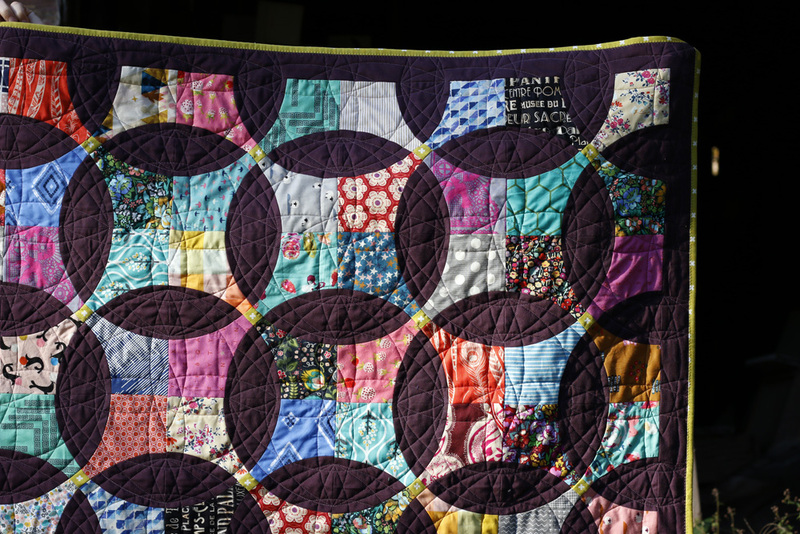 To emphasize those fussy-cut XOXO center pieces, I bound the 67” quilt with the same cheery basic. This punchy citrine brings out the purple tone in the raisin solid. Quilting it was a fun challenge! I found a circular motif that would look interesting when overlapped. 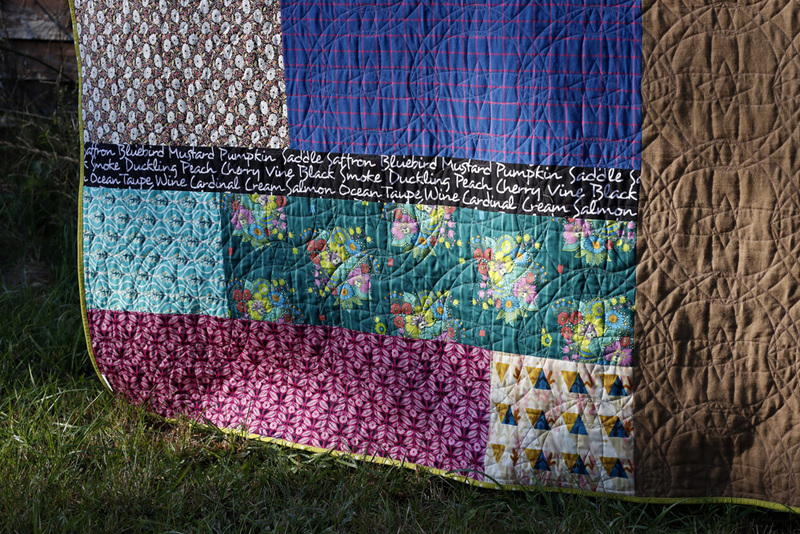 I’m really happy with how the motif creates a flourish of stitching in the raisin flower petals and a star at the center of the patchwork prints. I used a medium purple thread so that it would not look too light on the raisin solid or too dark on the low volume prints. Generally I like my thread color to blend, even when the quilting is special. The backing is my usual hodgepodge of fabrics on hand. Some of them were used in the quilt top and some were not. My goal with backs like this is to create a color vibe that meshes well with the quilt top. I generally start by choosing a few large cuts of fabric and then fill in the holes, while mapping out everything on the floor. Easy peasy and no pressure. It can be a good time to use fabrics that don’t necessarily patchwork well, such as flannel or linen. 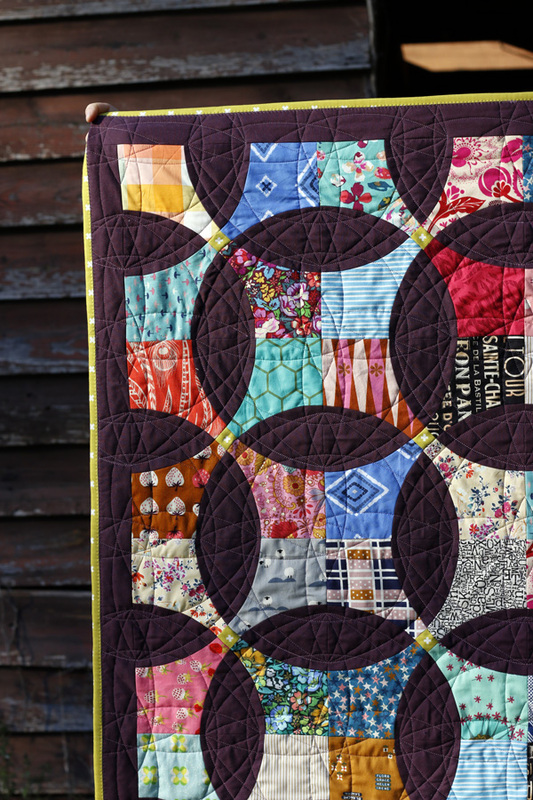 I’m glad the backing includes some less-busy prints that really show off the quilting! Thanks so much for your encouragement about keeping the quilt. You helped me remember that I haven’t kept a throw quilt “just because” in a really long time. This one had my heart right from the start, so I think it’s meant to be. And speaking of thanks, my gratitude for your friendly congratulations on Elora’s birthday and your helpful feedback on my Online Sewing Classes inquiry. Based on your suggestions, I have some things in the works for the new year. You’ll hear more about that in December! So that’s all for now. Wishing everyone in the states a happy Thanksgiving!